A range of drum sticks made from American-sourced hickory, available in various sizes in wood or nylon tips and supplied in packs of 1, 3 or 12 pairs. 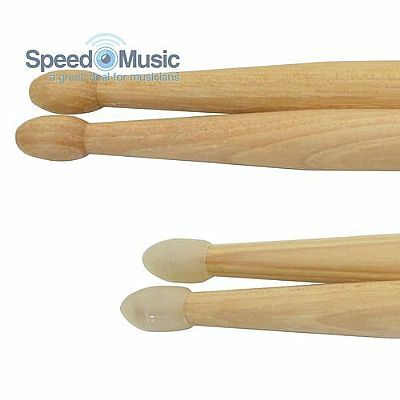 Premium drum sticks with excellent flexibility and shock absorption. Crafted from American sourced hickory. Pair of 5A - Wood, Dimensions (each)408 x 14mmØ, Weight (each) 51g. Pair of 5A - Nylon, Dimensions (each)408 x 14mmØ, Weight (each) 51g. Pair of 2B - Wood, Dimensions (each)408 x 16mmØ, Weight (each) 62g. Pair of 2B - Nylon, Dimensions (each)408 x 16mmØ, Weight (each) 62g.